I slept last night with a promise never to lose to any of you again. I slept last night praying for all of you. I slept last night seeking vengeance. I started the first step today. Never mind the opening quote. I am sure it is not for most of you, dear readers. They say dogs are man’s best friends. I say dogs are not meant to be only best friends but REAL friends as well, something hard to see with the people you once considered friends in this society. Though they can’t speak nor do what we humans do, they will always be there at your side whether you are happy, lonely or mad. Guess how many of your human friends can do that. Maybe one? or 0.5? We had Bruce and Sashi vaccinated this morning. I am not sure about the injections but I think Bruce was dewormed and injected with anti-rabies while Sashi was injected with…well I don’t know (I’ll ask the vet, I can’t understand the record). At some point, I thought dogs are braver than humans. Bruce and Sashi didn’t cry nor moan nor whatever unlike most people do. Well, it was nice to see and know that my dogs are well protected from any virus that might make them sick. It is also good to know that I am protected from Bruce’s bites. Well, that’s all. Let us hope the Dallas Mavericks win in Game 6 to prove some arrogant but ignorant people out there that their King James, who by the way is a king without a ring, that they need to be humble sometimes. Dogs are better than you all. The past few days seemed so long and dull. I wanted to return to writing as soon as I decided to take a break but I needed time to refresh myself from the stress and heavy feeling I had during that time. Now I am back and hoping never to “quit” writing again. For in writing alone I can express what is inside me. And for writing alone I can extend to the whole world and perhaps immortalize my existence when the end of the earth comes. I want to thank you all for the continuous support even when I was gone. I checked my views around three times during my week-long goodbye and I still got a decent number of views. So thanks. The past week had been my renewing week. Yes, it was boring at most points but there were happy parts too. I got to spend time with my family before I hit school this June 13. I learned things in life and learned to accept mistakes and say apologies. And most of all, I got my very own dog, Sashi. I was surprised when mom and dad gave me a two-month-old pug after mass last Sunday. I wasn’t expecting any gift, especially not a dog, until my birthday or until after the first semester. Mom promised me a dog if I become a part of the dean’s list this semester. 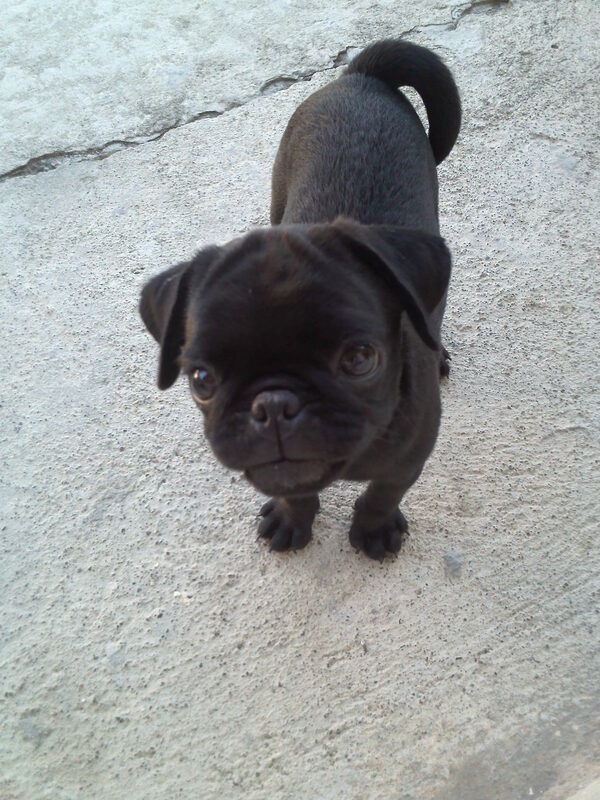 But there she goes, a rare black pug given to me even before school maybe as inspiration to strive for the best. Born last March 13, Sashi is in no way shy as a puppy is expected to be. When she first hit the floor of our house, she started to run around while enjoying the new home as if it was a blessing to her to be a part of the family. She is always sleepy and hungry like Bruce. She is playful, especially when Bruce is around. I was also surprised about Bruce not being jealous of Sashi. I half-expected him to seek for more attention now that we have a new dog but he did not. 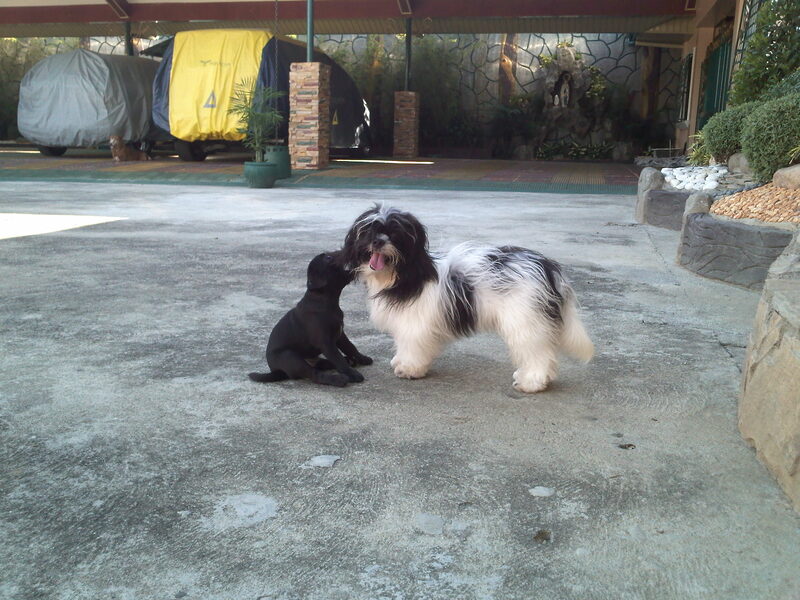 Instead, he became happier that he has a new companion and playmate. He even became more kind to us and unusually obedient. Of course, he became more playful. I am very thankful of having Sashi around. Thanks to my parents especially mom who gave Sashi her name. This is too much for an inspiration and I promise to do good in my college studies. Now that I am back, I promise to write good articles for you. I may not be able to blog when exams and long tests come, but I assure you good posts every now and then. Welcome back to me and thanks to all of you. For videos of Bruce and Sashi please click here.